SNAG has announced that its current Editor, Emily Zilber, is departing the organization and that Adriane Dalton will fill the position on an interim basis. Zilber’s last day will be January 31, 2019 and she will work closely with Dalton in the transition. Zilber joined SNAG at the end of 2017 and oversaw the debut of a totally new editorial voice for Metalsmith Magazine while also introducing a companion publication, Metalsmith Tech. In addition, she oversaw publication of the 2018 Jewelry and Metals Survey (JaMS), SNAG’s annual photo review of jewelry and metals in contemporary art, architecture, craft, and design. Dalton, who will take over editorial duties on February 1, 2019, is a writer, artist, curator, and educator based in Richmond, Virginia. She currently serves as Teen Programs Coordinator for the Virginia Museum of Fine Arts and teaches at the Visual Arts Center of Richmond and ART 180. She is a regular contributor to Art Jewelry Forum, where she interviews contemporary jewelry artists, curators, collectors, and gallerists. “As sorry as we are to lose Emily, we’re very excited to have a writer, curator, and artist of Adriane’s caliber step in as Interim Editor,” said Rukenbrod Smith. SNAG is pleased to announce its new Editor, Emily Zilber. 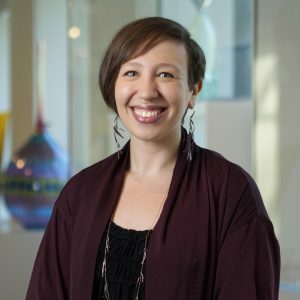 Emily currently serves as the Ronald C. and Anita L. Wornick Curator of Contemporary Decorative Arts for the Museum of Fine Arts, Boston. She has served in that position for 7 years. Emily was the Assistant Curator at Cranbrook Art Museum before her position at the MFA. Emily has edited and written numerous publications, articles, exhibition texts, including the catalog for Crafted: Objects in Flux (2015), Contemporary Highlights from the Museum of Fine Arts, Boston (2016), “Craft’s Restless Boundaries” in Crafting A Continuum: Rethinking Contemporary Craft (2013), and “Curator’s Eye: Thomas Gentille,” Modern Magazine (Summer 2012). The Editor position at SNAG recently was reorganized to become a full-time position overseeing the editorial content of the award winning Metalsmith magazine, the launch of a new publication Metalsmith Tech, and the annual Jewelry and Metals Survey (JaMS). “I am honored to join Metalsmith and the SNAG team, especially at a time of exciting change for the organization. I look forward to growing Metalsmith’s vital voice in a way that serves the diverse SNAG community and warmly welcomes new readers. 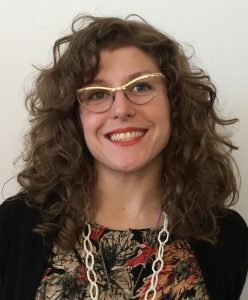 I am eager to work with SNAG to develop innovative new publications, platforms, and conversation spaces that can shape and engage the field in meaningful ways,” says Emily. Emily will begin her position on November 27, 2017 as a part-time employee and move into the position full-time April 1, 2018.